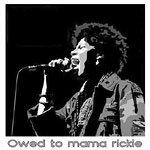 Yes... ''Owed'' instead of ''Ode''; the obvious play on words speaks to a promise from daughter to mother to finally release an album that taps directly into her spiritual roots. Still laden with the signature bass heavy, drum snapping funk of her production, the vocals this time around are rich with the soulful musings of the ancients. Songs like ''Dr. Feelgood'' warn of sugardaddies preying on the weak with worldy psessions while ''More & More'' (a duet with grammy nominated singer BILAL) reminds you to love yourself, friends, and family. ''EZ Duz It'' is a funky groove about life in the neighborhood while ''All In All'' and ''The Key,'' channel energies of the ancestors to cleanse both mind and spirit. Promo copy with barcode crossed out, but in excellent condition.